Battery life - around 70 minutes. 4K at 24fps (interpolated), 2K at 30fps, 1080p at 60fps or 30fps and 720p at 120/60/30 fps. 4K and 2K at 30fps, 1080p can be recorded at 60fps to 120fps, while 720p can be recorded at 120fps or up to 240fps. Battery life - around 100 minutes. 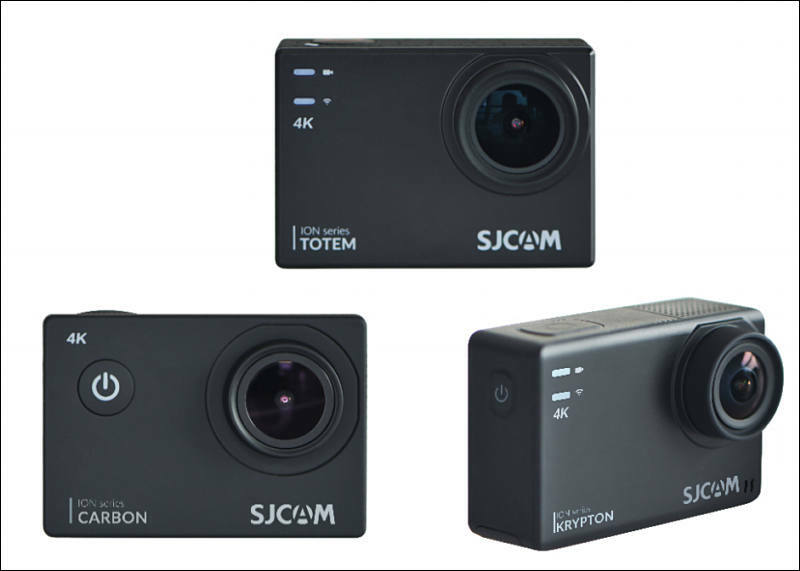 SJCAM, the action camera manufacturer who eased its way in to the market with the release of the SJ4000, is pleased to announce the launch of its new ION-series. Designed for those who want to capture their adventures this new line of cameras consists of three models, namely, Carbon 4K, Totem 4K, and Krypton 4K UHD. Following on from the success of SJCAM’s SJ8 Series, the ION Series features impressive tech and specifications perfect for adventure lovers and thrill seekers who want to capture their journey. Each camera features built in WiFi for connecting to a smartphone or tablet for viewing recorded files via the SJCAM Zone app. All 3 cameras can be used as dash cams and both the Carbon 4K and Krypton 4K UHD can record up to 4K at 30fps. The lightweight, slim design makes them perfect for any activity, whilst the included waterproof housing is capable of keeping the cameras waterproof up to 30m deep. The Carbon 4K, Totem 4K and Krypton 4K UHD will be available in soon in chain stores across Europe. SJCAM, the action camera manufacturer who eased its way into the market with the release of the SJ4000, is proud to announce that it will be showing its new ION-series to the public for the first time at The Video Show. The Video Show will take place between 16-19 March 2019, and will be co-located with The Photography Show at the NEC in Birmingham. The ION Series will be on show at the SJCAM stand G95. "We are very privileged to be able to show our new ION series at the Video Show" said Leszek Podpora "We are looking forward to demonstrating this range to the public and building on the success that we have had with the previous SJCAM ranges. These new models are very cost effective yet have a great range of features". A lightweight, slim design which makes the cameras perfect for any activity, whilst the included waterproof housing is capable of keeping the cameras waterproof up to 30m deep.